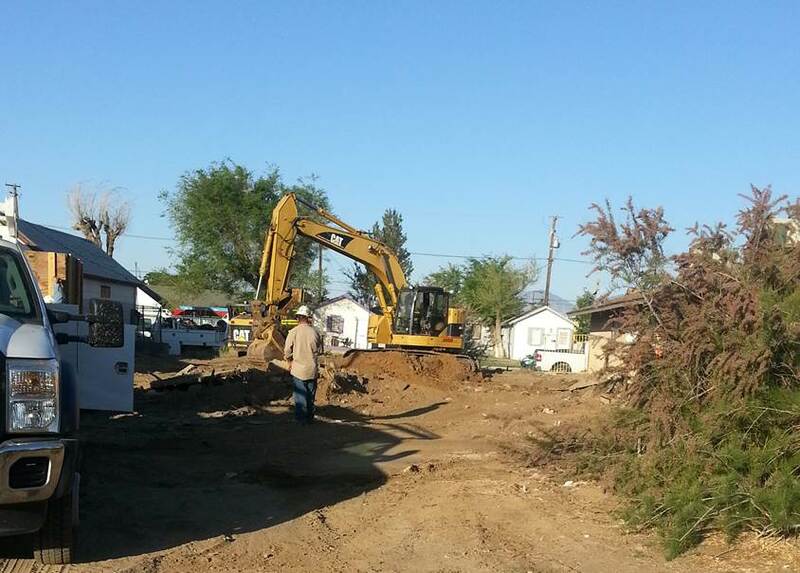 Habitat for Humanity Starts Building in Mojave! August 9: For the first time in Mojave, Habitat for Humanity is in the process of rehabilitating a house in downtown Mojave. The house, 15556 K Street, is on the southeast corner of K and Trinity and was recently donated to Habitat by the family of the previous owner. The house, is undergoing massive restoration, including reinforcing and pouring a new foundation, a totally renovated kitchen, all new windows and doors, and updated bathroom, new roof, walls and interior paint. Habitat’s full time construction manager Eric Mosby is on site five days a week, Tuesday through Saturday, coordinating new construction and materials. 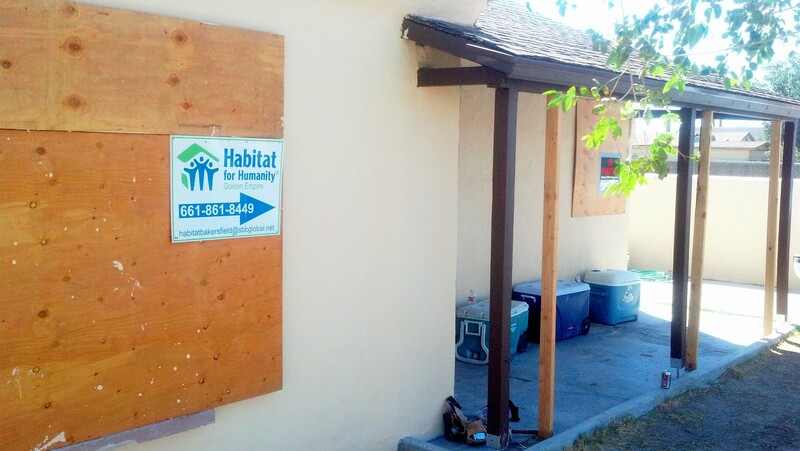 This branch of Habitat is located in Bakersfield, and is looking for volunteers from Mojave community to help out during the week, and especially on Saturday. If Habitat can get greater community participation they can rehabilitate additional homes in Mojave; and if there is overwhelming community support there is the possibility of new home construction. 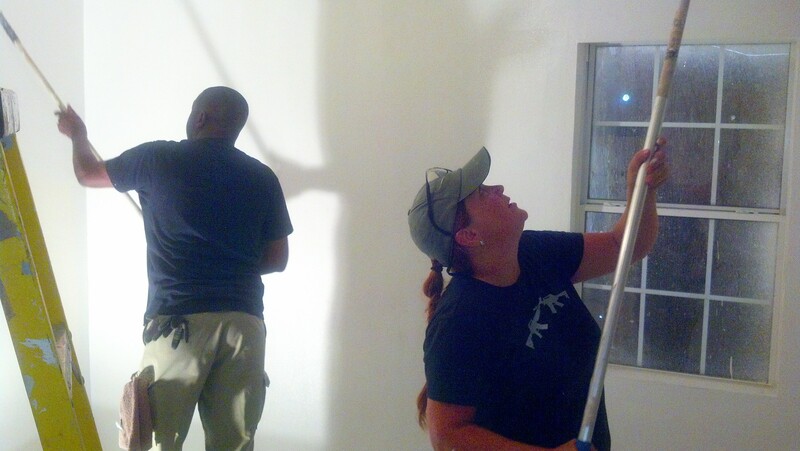 The Mojave Foundation is an avid supporter of Habitat for Humanity, a nonprofit 501c3 organization headquartered in Atlanta, Georgia dedicated to restoring and constructing safe, healthy housing to families around the world. Recipients of Habitat homes must be employed and undergo an extensive screening process. Contrary to popular myth, homeowners purchase the home, which is relatively inexpensive due to volunteer labor and donated materials, but are responsible for maintaing the property and are required to invest substantial levels of “sweat equity”. If you are interested in volunteering, please call Habitat’s volunteer coordinator, Pat Rhodes at 661-861-8449, or email at hfh-pat@sbcglobal.net. Click here for the global Habitat for Humanity organization; click here for the Bakersfield Habitat for Humanity branch. This entry was posted in Beautification, Cleaning up, Habitat for Humanity, Housing, Mojave CA, Volunteer on August 10, 2014 by mojavefoundation. Community gardens are pieces of land where plants are grown and maintained by a group of individuals in the community. They are generally divided into plots for individual, family, or group use, and can host a variety of community events. The Revitalize Mojave Vision Plan outlined how community gardens would add value to Mojave, and address several of its critical needs. The Mojave Foundation, whose mission is to encourage grassroots development of Mojave, is well placed to organize and execute the development and construction of a community garden. We need your input to develop Mojave’s community garden into a useful and valuable space! Please follow the link to the following survey. This entry was posted in Amenities, Beautification, Cleaning up, Community events, Kern County, Mojave CA, Volunteer and tagged Garden on July 12, 2014 by mojavefoundation. May 23: Residents throughout Mojave joined forces on Friday morning to embark on a massive project to clean up the entire Western Village neighborhood in Mojave. About 30 volunteers, mostly from the affected neighborhood, removed couches, mattresses, and garbage from the streets and alleyways of Edwin, Arthur and Milton streets. Four County agencies contributed to this effort including Code Compliance, Waste Management, County Roads and the Kern County Sheriff’s Office (KCSO). Most of the volunteers were informed of the event during a door-to-door campaign conducted by The Mojave Foundation the previous Monday. The volunteers also inspired many neighbors to come outside during the cleanup with their kids and relatives and start picking up their own yards. 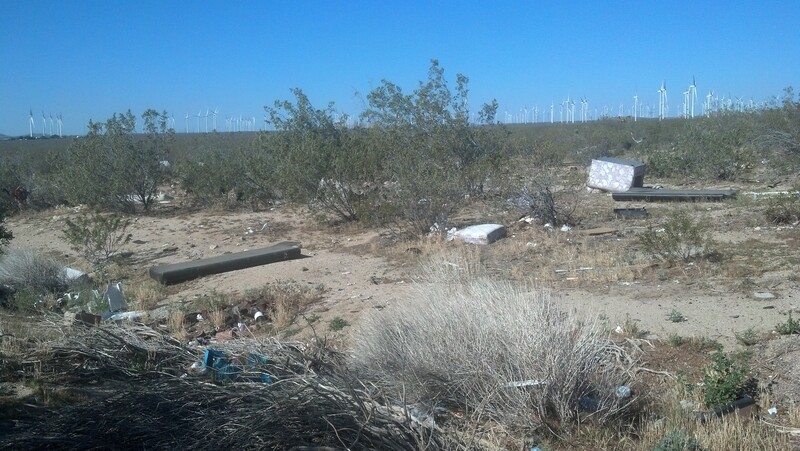 The Mojave Foundation is confident that the local residents are now invested in helping to KEEP the neighborhood clean and make this cleanup sustainable. 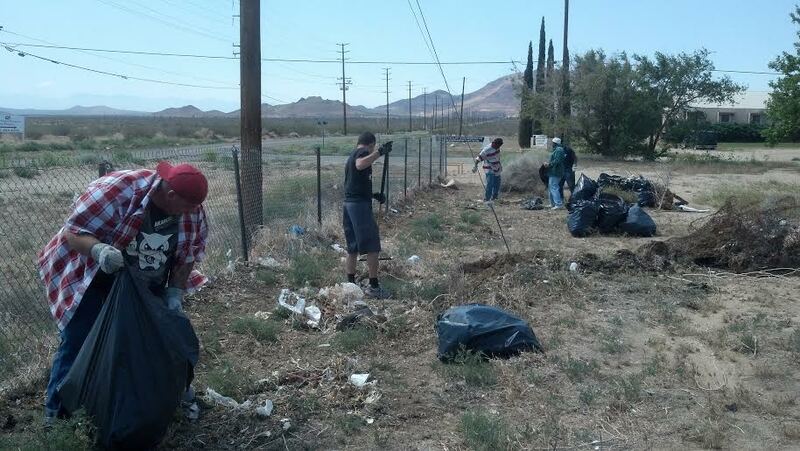 Friday’s cleanup was a joint effort between The Mojave Foundation, local volunteers and four County agencies. Code Compliance provided the trash bags and gloves, Waste Management provided access to the dump, KCSO proved the CSU volunteers for security, and most importantly, Kern County Roads provided three dump trucks and five drivers, which was critical this event. County Roads employees – some of which are from Mojave – hauled away 11 dump-truck loads in less than 3 hours (equivalent to about 25 pickup trucks full). 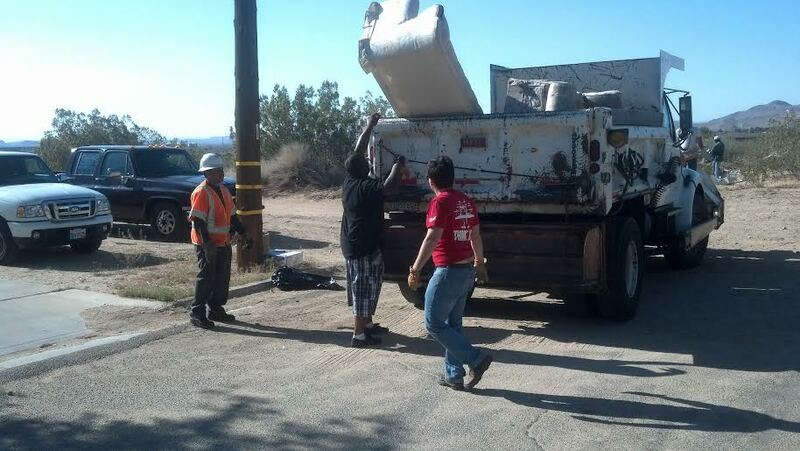 Under the leadership of Mojave Roads Foreman, Dan Duckworth, volunteers were able to work at maximum efficiency for three hours, removing every mattress, couch, and fire hazard in Western Village. The Mojave Foundation considers this a “force multiplier”, and salutes Mr. Duckworth and his crew’s professionalism and proficiency. The Mojave Foundation would also like to credit Leon Ryder for conceiving of Friday’s cleanup, and inspiring residents and volunteers all over Mojave to pitch in. Mr. Ryder, who spontaneously decided to paint over some graffiti in his neighborhood several months ago, has inspired a grass-roots miniature revolution in Western Village and all over Mojave. 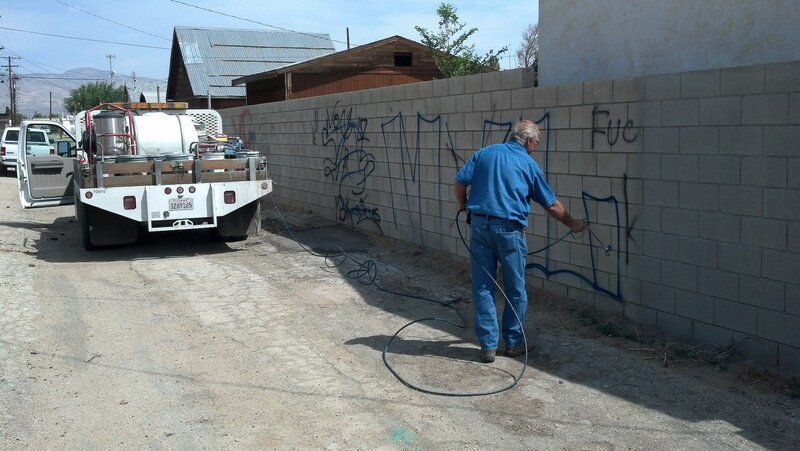 Mr. Ryder and The Mojave Foundation are now working directly with residents and Kern County General Services to remove graffiti immediately and efficiently. The Mojave Foundation salutes Mr. Ryder’s “leadership by example” and countless volunteers who made this and other cleanups possible. For more information on how you can volunteer fill out one of our volunteer forms. Click here for information on how you can donate to the cause. This entry was posted in Beautification, Cleaning up, Kern County Roads, Mojave CA, Selfless Service on May 27, 2014 by mojavefoundation. May 19: The Mojave Queens teamed up with the Mojave Foundation and several local volunteers to knock on doors in Western Village, to tell residents about a cleanup in that Neighborhood on Friday, May 23rd at 8:00 a.m. Mojave Queens included Miss Mojave, Merysa Rangel, a junior at Mojave High; Ana Marquiz, Miss Junior Mojave; and Rhaylene Joaquin, Little Miss Mojave. “We all need to pull together to keep this place clean” said volunteer Isaac Martin, a junior at Mojave High, “These guys are trying to do a good thing, and we all need to pitch in.” Mojave’s own volunteer police squad, Citizen Service Unit (CSU), also participated, providing security and overwatch while our volunteers walked door to door. The cleanup on Friday will target three areas in Western Village that have accumulated garbage and furniture for years, including the desert and alley behind Edwin Street, and the apartments on Milton. 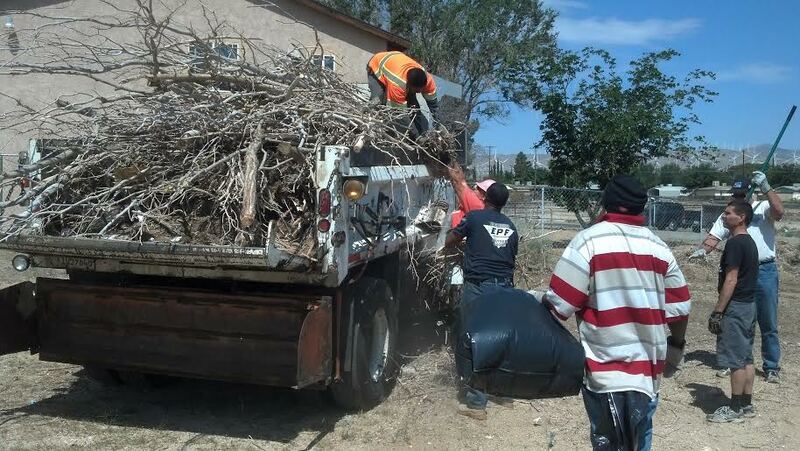 The Mojave Foundation is determined to partner with local residents in the affected area to help remove the trash and keep the neighborhood clean once and for all. Volunteers also passed out information on Neighborhood Watch and graffiti consent forms, which allow The Mojave Foundation to remove graffiti immediately with the permission of the property owner. The Mojave Foundation would also like thank Leon Ryder for organizing the door-to-door campaign and the cleanup this Friday. 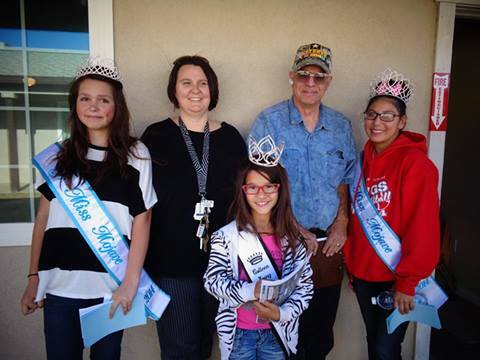 This entry was posted in Beautification, Cleaning up, Community events, Miss Mojave, Mojave CA, Security, Volunteer on May 20, 2014 by mojavefoundation. 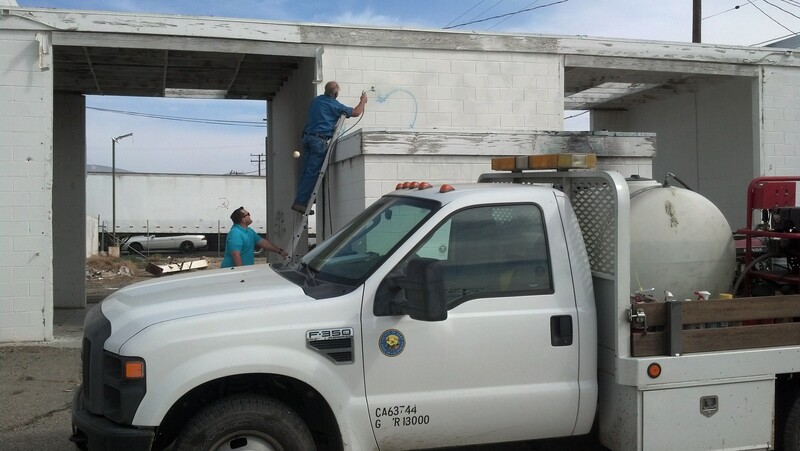 Kern County General Services can remove most graffiti upon receiving a request from the property owner. Any resident can request to have the graffiti removed, but must first have the property owner sign a consent form (also available in Spanish). General Services is usually in Mojave several times per month, and can usually match the color of the paint fairly closely. Residents can mail the completed consent form to 610 E 18th St, Bakersfield, CA 93305, or take a picture of the completed form on their phone and email the form to Leon@MojaveFoundation.org. 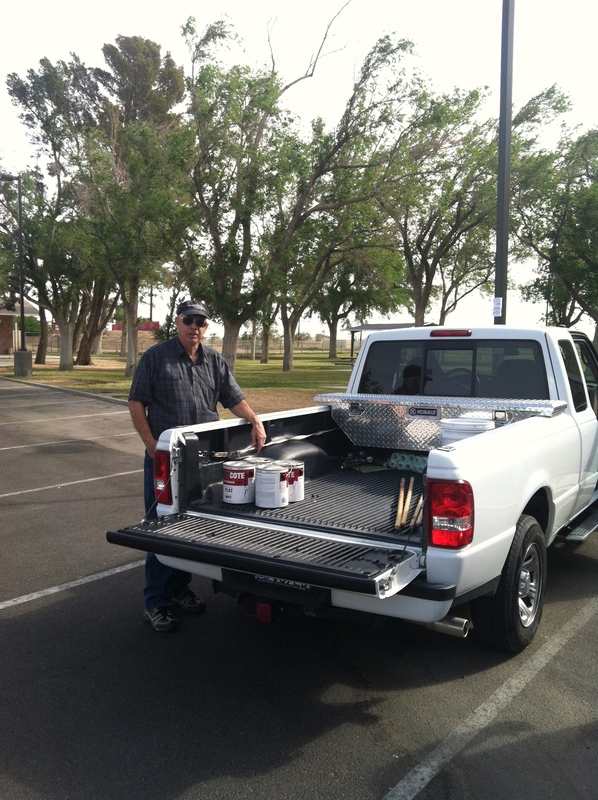 The recent momentum behind graffiti removal in Mojave was due to the initiative of a local resident, Leon Ryder, a retired school teacher, who took it upon himself to tackle some of the worst graffiti in his neighborhood – on his own time, using his own paint. Leon sparked a miniature revolution in Mojave, and has inspired a myriad of other residents and business owners to do the same. The Mojave Foundation is proud to partner with Leon, and excited about recent donations of paint from Kern County and other local residents. We also appreciate the support from Kern County General Services and recognize that dollar-for-dollar, Graffiti Removal is one of the best ways to reduce crime and increase public safety. Removing graffiti sends a message to gangs and vagrants that the residents take pride in our community, and we think there is a direct correlation between clean streets and safe streets. We look forward to partnering with Kern County General Services, where The Foundation can eliminate highly visible graffiti quickly and efficiently, while coordinating with the county to knock out larger jobs more efficiently. We are also looking for volunteers to help with graffiti removal, clean-ups, and a door-to-door campaign to collect pre-approved consent forms from property owners. To help out, please see our VOLUNTEER page. This entry was posted in Beautification, Cleaning up, Crime, Kern County General Services, Mojave CA, Safety on April 18, 2014 by mojavefoundation. 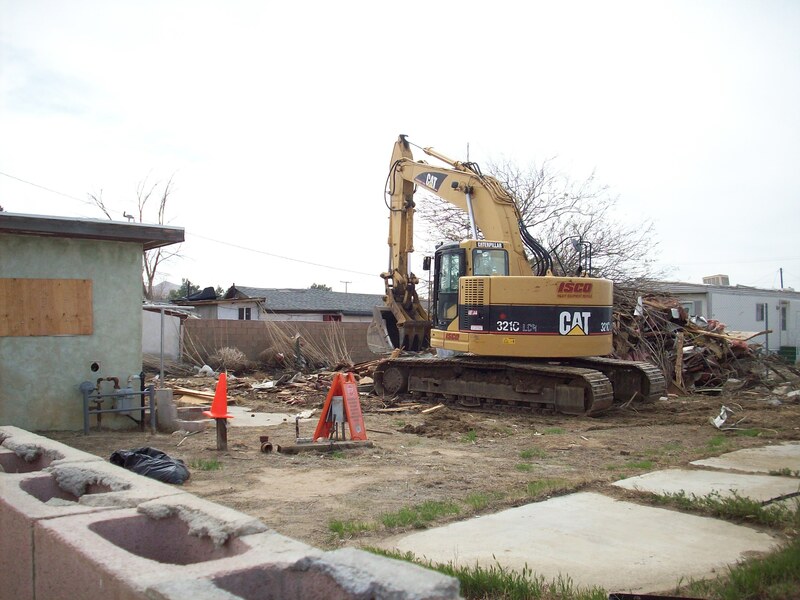 March 24: Another demolition occurred on K Street, marking the sixth hazardous structure in Mojave to be demolished by Kern County Code Compliance since November. The building on the 15900 block of K Street was one of the most widely-known trouble spots, frequently used by vagrants and drug users passing through Mojave. It was also an obstruction for future development, lowering property values as the property steadily continued to deteriorate over the years. The house suffered water damage caused by a hole in the roof, and sustained substantial fire damage after a homeless man started a fire in the property two years ago. The abandoned building next door is also targeted for demolition, and should come down by April, breathing new life into a strategically significant block with incredible potential. Located in the center of our downtown area between Inyo and Cerro Gordo, these buildings are straddled by Spaceport Court on one side, a highly reputable apartment complex, and KCROP on the other, a county-sponsored organization providing custom teaching and vocational programs. With these two hazardous structures removed, Mojave can finally start having serious discussions about developing these areas, and putting new homes or businesses in those spaces. Code Compliance, historically limited in budget and resources, was recently injected with additional funding by District-2 Supervisor, Zack Scrivner, and the department has dramatically increased their scope and efficacy in unincorporated areas like Mojave. Demolitions, cleanups, and boarding of abandoned structures are still charged to the property owner in the form of a lien, but at least now the most urgently blighted structures can be removed quickly when they pose a danger to the public. The Mojave Foundation is grateful to Supervisor Scrivner and the leadership and staff at Code Compliance, and is proud to help coordinate with the county to make this possible. This entry was posted in Beautification, Cleaning up, Kern County Code Compliance, Mojave CA, Safety on March 24, 2014 by mojavefoundation. March 11: “Another one bites the dust” remarked one excited resident, marking the fifth hazardous structure to be demolished in Mojave since November. 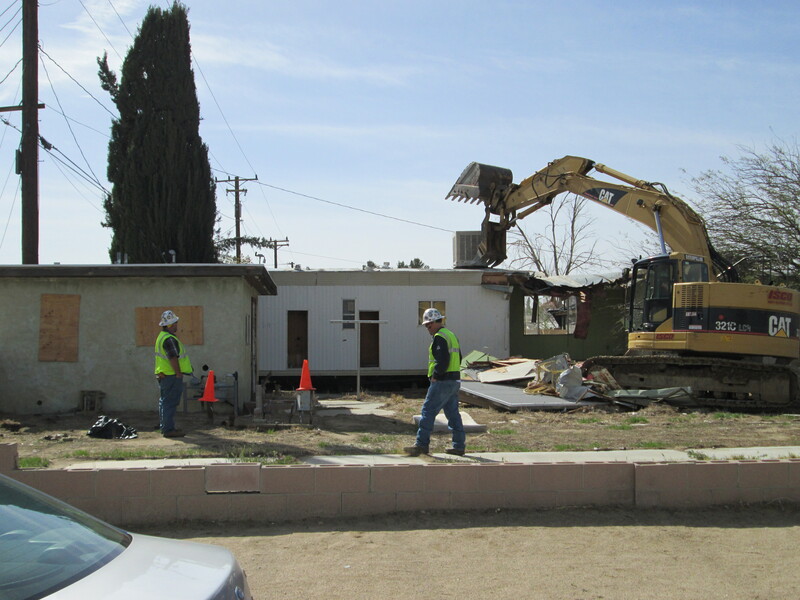 The trailer was demolished by Sturgeon Services in Bakersfield, as part of a recent push by Kern County Code Compliance to remove derelict structures and raise housing standards in Mojave. This trailer was one of the most inviting structures for vagrants and drug users in Mojave, conveniently hidden behind trees and completely wide open and inundated with trash and drug paraphernalia. The adjacent utility shack will be torn down in the next several days or weeks, and the next door trailer will be boarded up and secured, ensuring that this property will no longer be a sanctuary for drugs and crime in our community. Removing these derelict structures from our streets is the first step to changing the unsightly image of Mojave, and creates the necessary space to allow the community to have a serious discussion about community development. These trailers were the first thing visitors saw when entering the Mojave Air & Space Port on Belshaw Avenue, and now the drive into the airport is a little less foreboding. The Mojave Foundation is proud to contribute to the organization and coordination with Code Compliance to remove these hazardous structures, and we look forward to serious discussions with housing developers to bring clean, quality housing to working-class families downtown. 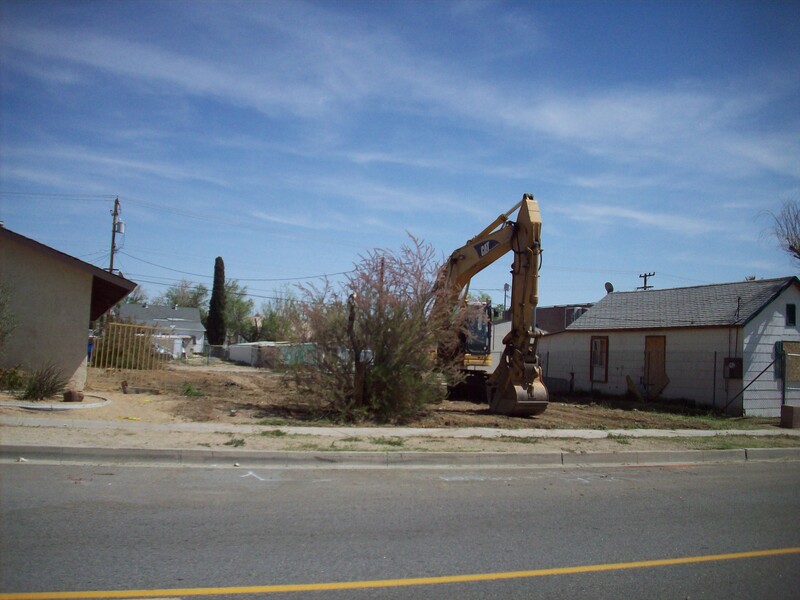 This entry was posted in Beautification, Cleaning up, Kern County Code Compliance, Mojave CA, Quality housing, Safety, Security on March 11, 2014 by mojavefoundation.